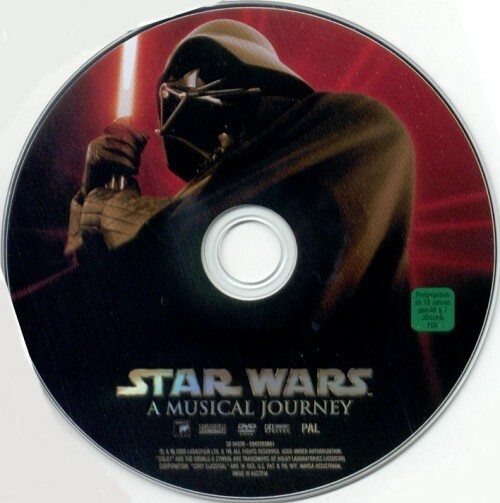 Star Wars: A Musical Journey is a bonus DVD program included with the soundtrack album for John Williams's musical score for Star Wars: Episode III Revenge of the Sith. It was released May 3, 2005. Expectations for this (last?) STAR WARS film were raised exceptionally high. This would be it. After almost thirty years, we would finally witness and see what exactly pushed Anakin Skywalker over the edge and made him the most feared (but at the same time also the most beloved) villain in the galaxy. How the young and powerful Jedi by fighting his faith and destiny, only quickens its fulfillment and his fall into darkness. For us film music fans, STAR WARS had always something extra to look forward to: a new score of Williams, who, at least me for me, has always been able to capture the real spirit of STAR WARS, wherever George Lucas painfully failed to do it. If you feel empathy or sorrow or happiness you have Williams’s fantastic music to thank for. The quality of the prequels is open for debate, but whether you like them or not, the quality of the music can’t be denied. So it was with great excitement I picked up the score about two months ago (wow, time does fly!). After my first listening, I felt rather disappointment: a couple of themes I had expected to hear (like Anakin’s Theme or Duel of the Fates) didn’t seem to appear on the album, and some others were too poorly represented (the Emperor’s Theme and even The Imperial March, which pops up but very occasionally and never in a very powerful statement). On the other hand, the general tone of the music seemed quite right: dark, depressing and lots of action cues. The more I listened to it, the more it grew on me. And of course, seeing and (above all) hearing the music in the film always helps to appreciate particular pieces and tracks. Let’s examine the different tracks (a more detailed analyses will follow whenever I got the time). The indispensable main theme is immediately followed by rhythmic, militaristic action-music (strong percussion, lots of brass), interwoven with some familiar themes, like the excellent, quite triumphant rendition of the Force Theme (1’38-2’04). We plunge (quite literally) into the heart of the war that has been tormenting the Republic for the last three years and witness Obi-Wan’s and Anakin’s rescue mission to secure the kidnapped Chancellor. Around 4’46-5’20, we encounter a new (pompous) theme that introduces General Grievous, the feared battle droid leader. This is followed by more subdued music performed by agitated strings and a fast percussion, gradually building to a climax but never quite reaching it, and at the end of the track the music faintly fades out. One of my personal highlights of the album. A solo violin brings, in interaction with a flute, a counter melody of Across the Stars. It is one of the most poignant renditions of the love theme and foreshadows perfectly the heartache that is inevitably to come. The lovers share one of their last tender moments. The mood drastically changes (with a dissonant climax) when Anakin dreams of Padmé’s death. Low, heavy strings accompany Anakin’s confession to Padmé about his dream. The love theme is resumed (2’25) when Padme tries to comfort her husband but very soon the dark and brooding feeling reappears. Anakin still has doubts. The track ends with surpising flourishing music. Kind of a pompous title for – er – pompous music. Which doesn’t mean I don’t like this new theme. Actually, I like it a lot. Comparisons with Duel of the Fates are not totally superfluous; there are some resemblances, for example the underlying string section in the beginning or just the pure gravitas of both themes. Different is the approach: while Duel, though very beautiful, stays rather distant and refers to the more abstract rise of evil (Darth Maul is “cool”, kills Qui-Gon, but that’s about it, he’s just a character with no further great meaning or contribution to the story), Battle is much closer and direct. Here, evil has a face, a face of someone we have come to know and perhaps love. Here we observe the painful battle between two best friends who would never have suspected it would ever come to this, to this fight between darkness and light, between life and death. The sudden impressive presence of the choir captures perfectly the heartbreaking and dramatic essence of the scene (where a great number of fan boys have been waiting for). Here and there (1’02 or 1’22 for example), the music almost sounds like a ballet; you see Anakin and Obi-Wan, jumping from platform to platform, trying to avoid each other strokes, as in some kind of twisted dance. The Force Theme also makes its appearance (1’56), thus changing the whole rhythm and forming a small breathing space. An oboe (3’11) repeats swiftly and softly the theme. The track ends with a “Williams-bang”. Here we can finally hear some traces of Anakin’s theme (so it is present on the soundtrack!) performed by dark, descending strings in the beginning of the track. Soaring strings, brass and powerful vocals create an agonizing lament that dominates the screen while we see the terrible consequences Anakin’s betrayal has for the Jedi Order. This is the heart of Revenge of the Sith, the moment that leaves you in total silence and awe. All the drama is followed by this more playful action cue. A strong almost ethnic percussion (which brings the scores of JURASSIC PARC and THE LOST WORLD to mind) urges the strings, brass and even a harp on. Around 0’38 we can hear another short rendition of the Force Theme, brought in the same ethnic and driving style. In this movie, the Force Theme refers very often to Obi-Wan, like here, during his wild chase on Grievous on that (very annoying) lizard-thing. A very dark and sinister beginning, above all mood music, sounding like a Tibetan chant. Gradually, low strings and a solo trumpet interfere, playing an ominous melody. Things are turning bad, Palpatine’s influence begins to grow. And then, for the very first time on the soundtrack, we can hear it, the theme we’ve all been waiting for; Darth Vader’s theme makes its first appearance (2’37). Anakin leans more and more to the Dark Side. The Force Theme (2’59) follows suit, as some kind of antidote for Palpatine’s poisonous evil. Around 3’40, low strings and mysterious voices bring a dark crescendo that fades away slowly, breaking apart. The track ends in the rousing Coruscant fanfare of THE PHANOM MENACE, thus breaking the sinister mood. It’s a bit strange we never hear the Emperor’s Theme as one would expect. It nevertheless works and seems to focus more on Anakin’s internal battle. Another personal highlight. The most eerie piece on the soundtrack. A woman’s voice sings a haunting, indistinct melody which really gives you goosebumps. It goes deep, creating a feeling of utter powerlessness and sorrow. Around 1’16 you can hear a creepy reminder of Across the Stars. Things are spinning out of control, and even love is unable to cope with the growing threat. (This is also one of the most poignant scenes in the movie: Anakin thinking of Padmé, Padmé thinking of Anakin, and Anakin making his decision, aware that he is selling his soul to the devil). This is how Battle of the Heroes (approximately) can be heard in the movie. Strong percussion and heavy brass; it thunders above all the volcanic tumult. Here and there, it’s intercut with Vader’s Theme, performed similarly to Clash of the Light sabers in EMPIRE STRIKES BACK. (Quite interestingly, Yoda says at this moment in the movie to Palpatine that his faith in his (Palpatine’s) apprentice might be misplaced. And indeed, when we hear this music in EMPIRE, it’s just before Vader asks Luke to join him, to rule the galaxy as father and son. Finally, around 2’37, the choir makes its entrance. At 3’20, accompanied by the Force Theme, Obi-Wan and Anakin use the – er – Force on each other. This track also ends a bit in suspense. In the movie, it is followed by Duel of the Fates, which unfortunately doesn’t appear on this soundtrack. All in all, Anakin vs. Obi-Wan doesn’t reach the same strength as Battle of the Heroes, perhaps because the choir isn’t used that prominently. The beginning sounds strangely LORD OF THE RINGS-ish (The seduction of the Ring theme), and even the choir that follows is quite similar to the Nazgûl theme. The second part starts with another crescendo (2’14), this one reaching a climax. The music grows in persistence: Obi-Wan informs Padmé of Anakin’s dark deeds. Low strings and brass keep repeating the same motive with slight variations. Around 3’17 Obi-Wan (finally) understands that Anakin is the father of Padmé’s child and suddenly realizes how much his former Padawan has been able to keep secret from him. The brass section is repeated and further developed. Restless strings follow. Around 3’01, the threat is immanent and around 3’19, Lord Vader makes his entrance at Mustafar, killing the Separatist leaders. The Force Theme breaks through as some kind of last convulsion of the Good Side (3’43), but it is too late; the Dark Side has won (the Emperor’s Theme – one of my favorite SW-Themes – 3’49). Strings bring a very sorrowful and angsty melody, full of incomprehension of how it could have come to this. The music becomes dissonant when Anakin’s clothes catch fire (0’57) and he yells full of hate at Obi-Wan. Around 1’57, the music becomes more urgent but it doesn’t lose its sadness (Obi-Wan ponders the events remorsefully). Great opening. Rhythmic music, performed by percussion and strings, lay the foundation for the brass which brings Sidious’s Theme. The choir adds an extra flavour of drama. The rest is of the track is unfortunately underscore, with few striking moments, except perhaps the variation of Across the Stars (1’58) (Padmé leaves for Mustafar). The theme has lost all its flamboyance and grandeur and is reduced to this sad, urgent rendition. Around 2’11, we hear the same string motif used in ATTACK OF THE CLONES, when Anakin hears about his mother’s fate and decides to go looking for her. Both times, the consequences are disastrous. A spooky lullaby accompanies the birth of the twins, which is actually intercut with Vader’s mechanical coming to be. This explains perhaps the “sterile” and distant music (and the absence of the wonderful Luke and Leia theme). Around 1’12 Vader gets his mask (much to his chagrin) and becomes the dreaded figure we all know. The circle is complete. The lament that follows (also used for Qui-Gon’s funeral in THE PHANTOM MENACE) is used when Palpatine tells Vader what he has done to Padmé. It is quite surprising that such “funeral” music is used. One would expect a triumphant rendition of the Imperial March. But none of that. Instead, we get a very emotional Vader, accentuated by this grave music. The music expresses the sweet victory of Fate or Destiny and the tragedy of Anakin Skywalker. He himself is responsible for the thing he feared most. Despite the dire situation, there is hope, in Anakin and Padmé’s children. Both are brought to their respectively new homes. We first hear Leia’s Theme (0’07), as Bail Organa brings her to his wife. Luke’s Theme follows (0’28) (Obi-Wan leaves him in the care of his family on Tatoonie). As Beru and Owen Lars stare at the binary sunset, dreaming of a better future, we hear the beautiful (and very famous) rendition of the Force Theme (also used when Luke stares at the same sunset about twenty years later), where a solo French horn first brings the theme (0’51), and strings help to complete it. As in each STAR WARS film, the movie ends with the Main Title, here followed by a concert version of Princess Leia’s theme (a bit strange, perhaps it just refers to her future role in the rebellion). Battle of the Heroes follows, and then, strangely enough, the Throne Room Music (6’43) from A NEW HOPE, which is actually a strong and rhythmic rendition of the Force Theme. Perhaps all this references to A NEW HOPE only want to emphasize that despite the rather tragic ending, a – er – new hope is on its way, and with it, redemption will come. We hear some more variations on Luke’s Theme, a touching rendition of the Force Theme (8’59), and some more Throne Room Music. For me STAR WARS is synonym to great film music and Williams truly delivered again with a score that meets the expectations. It’s a pity not all good music is on the soundtrack, and some tracks on the soundtrack seem quite redundant (like Grievous and the Droids, to name but one). I don’t know if there are any plans of releasing a complete soundtrack, but if anyone knows a petition, please let me know. I’ll be more than happy to sign it. The circle is now complete. Well, apart from the innumerable planned spin offs. We've seen how he is redeemed and now we know how Anakin Skywalker fell. Certain to be thought of as the best of the prequels (which will always be the crap ones that were never as good as the originals), Revenge of the Sith is not without its faults, but most of those found in the first two simply aren't possible because of the inherent darkness (comedy Jar Jar moments would simply be entirely inappropriate, indeed, the gangly twit says nothing this time around and appears only fleetingly). Of course, reviewing either the film or score is largely academic since they will both prove hugely popular, but I must admit that on a some levels, Revenge of the Sith's score has some of the weakest moments of any Star Wars score, even though there is, of course, plenty of stupendous material. As has become customary for the prequel albums, the credits segue into music from later in the film, but returning to material accompanying the opening battle sequence later in the track. Another reviewer described it as Williams' 'Walton ceremonial style' action music and I can understand the comment; it doesn't have dizzying agility, but soldiers on with menacingly asymmetric rhythms, punctuated by the typical mixture of woodwind runs over brass and percussion. Occasionally a little directionless, but exciting none the less. For all the digital knowhow at his disposal (and an essentially limitless budget), Lucas' dream sequences seemed surprisingly hokey, but Williams' churning music effectively brings them to life as in the ensuing track. From this point, the score starts to make its mark as an extremely dark piece of work and far from the frolics of A New Hope. As I rather suspected might be the case, there is no new character theme this time, but Battle of the Heroes, which would be a wonderful change of direction for a Star Wars score had Duel of the Fates not got in their first (and with a better title). Unlike Fates' idiomatic choral writing, here the choir somewhat clumsily follows the strangely offbeat melody - there is little of Fates' imaginative interplay between chorus and orchestra, nor its taut dramatic narrative. Indeed, Battle of the Heroes has a somewhat under developed structure and its brief quote of the Force theme feels a little forced. If it was pure underscore, this would be understandable, but as a concert arrangement, surprisingly clunky. The brass hit finale also feels remarkably cheesy and, dare I say it, lazy as a conclusion. Far more effective would have been to allow the opening string figure to burn itself out and close on a quiet, low note rather than shoehorn in an unnecessarily explosive ending. A metaphor for the score itself; generally fine, occasionally brilliant, but a couple of surprisingly awkward moments. Some of the score's best and worst moments are at the film's dramatic centre. Anakin's Betrayal and The Immolation Scene are highlights. The former is almost Wagnerian in its melodrama, while the latter recalls the angst of Born on the Fourth of July, quite rightly standing out as it accompanies one of the film's most powerful scenes (although, in truth, the film should have been filled with far more of them). On the flip side, Palpatine's Teachings and Padme's Ruminations are as tedious as others have made out. The latter is fairly effective in the film, but its wailing vocals are flat on disc, while the low end groaning vocals of the former are similarly uninspiring even if the lonely brass solo introduced later in the cue works well. While effective in the film itself, neither are great album material nor are they especially typical of the Star Wars musical universe (particularly the wailing vocals, the most annoying soundtrack cliché du jour) which dislocates them even further from the rest. The remaining action has its moments. General Grievous continues the Chase Through Coruscant style of Attack of the Clones but at an even more frenetic pace and includes some fine percussion writing. Grievous and the Droids picks up the thread, but seems to have lost a little momentum in the interim. Anakin vs Obi-Wan makes great use of Battle of the Heroes, plus a reprise of the Duel from The Empire Strikes Back even if, strangely, those portions do not actually accompany Master vs Learner in the film itself. I'm not entirely convinced that such material sits ideally alongside the surging Battle of the Heroes chorus and doesn't even seem an especially clever reuse of material. If the material is quoted to show history repeating itself, then the film doesn't confirm this notion so its use seems somewhat mystifying. The Birth of the Twins is rather creepy, but Padme's Destiny reprises the funeral music from The Phantom Menace and reinforces how sublime a composition it is. A New Hope quotes the themes for both Luke and Leia (although not their combined theme from Return of the Jedi) before launching into what is almost a fantastic Star Wars End Credits redux (but, annoyingly, isn't). The main (or Luke's theme) starts off as usual, with the original segue into Leia's - thus looking forward to Episode IV, but also bringing back some of those sorely missed melodies. At climax of Leia's theme, Williams pulls off a brilliant segue into Battle of the Heroes, which blends into the Throne Room (extended edition from later compilations), but instead of simply using the original link back into the credits, it stops in its tracks and picks up again with the descending string motif before the credits ending from Return of the Jedi. Musically clumsy, it spoils what is so close to being an outstanding conclusion and even more irritating when all the links are written, they just need to be put together in the right order. That Revenge of the Sith is the most atypical of the Star Wars scores is certainly not an issue and there are a swathe of outstanding moments, but it also has a couple of rather dull tracks and a few where Williams seems to have been curiously uninspired, verging on careless. Not quite up to the par of the others, but I am bound to say that as with most Williams scores, it is truly a relative measure and there are unlikely to many finer efforts this year (although Howard Shore may once again pull out all the stops for Peter Jackson's King Kong). If nothing else, if Williams stays away from Potter and with no more Star Wars, he'll have a bit more free time around his Spielberg assignments to work on some films of real, rather than CGI popcorn drama. The Bonus DVD disc is, as far as I know, available with all copies and is a fine collection of clips from all six films, beautifully remixed (if only the original trilogy albums sounded so good on CD) with only small amounts of dialogue here and there. The introductions to each chapter by Ian McDiarmid are a little flat, but can easily be omitted and the highlights from Williams' 28 year assignment can be enjoyed in a 70 minute mega remix. Given that it makes no difference to the retail price, it's a nice bonus that seems like a surprisingly generous extra when every Star Wars fan will buy the album anyway and could have been a 'special edition' at premium rate. Thanks to Sony, thanks to Uncle George and mainly, thanks to JW. After 28 years and six films, George Lucas' Star Wars saga comes to an end with Episode III: Revenge of the Sith. It's been hard not to build up unusually high expectations over the years, while waiting for the latest Williams score in the series, but luckily the composer has managed to impress with every new Star Wars score written. At least until Episode III. I don't know if my expectations were just too high this time around, but Revenge of the Sith is perhaps the weakest of the scores for the latest three films in the saga. Which certainly doesn't mean that it's bad or uninteresting, but rather a little uninspired and lazy. One of the most important ingredients in the Star Wars scores has always been the themes. Partly because of Williams' leitmotif approach, but also because they are such integrated, popular and easily identifiable elements in all the movies. The new big theme created for Episode III is titled "Battle of the Heroes". It revolves around a sinister nine note motif and features all the ingredients of epic music - choir, brass fanfares, crashing and thundering percussion and swirlings strings and woodwinds. The problem, however, is that it actually isn't that exciting. There's nothing wrong with the orchestrations and the arrangement - it's classic Williams and very well executed - but the basic material, i.e. the thematic base could have been a lot better. Williams' Duel of the Fates, written for Episode I, is a perfect, and much better, example of the kind of powerful music "Battle of the Heroes" could have been. Still, the four minute long concert version included on the soundtrack, and its appearances in cues such as "Anakin vs Obi-Wan", is quite entertaining and offer some great highlights. 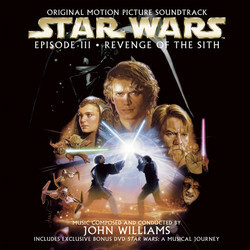 The soundtrack CD unfortunately lacks statements of some of Williams's recent, major Star Wars themes, such as the mighty Duel of the Fates. Or Anakin's theme. This, of course, doesn't mean that they aren't used in the film at all - they probably are - but having them incorporated into the score as presented on the soundtrack CD would have been welcome. The "Across the Stars" theme, written for Attack of the Clones, is heard in a few cues, but it's never given the lush, sweeping and romantic treatment which dominated its appearances in Episode II. Here, in Episode III, the theme is reduced to its simplest form, with Williams giving it a much more tragic sound. Instead, Williams relies a lot more on the major themes from the first three films, with focus on A New Hope, bridging the gap between the first film, from 1977, and the last, from 2005. The Force Theme is used frequently, and short statements of the Imperial March can be heard in a couple of cues, as well as lovely appearances of Luke and Leia's themes towards the end of the score. The big action set-pieces are dominated by Williams' typical syncopated brass and ostinato strings, evoking the action music from Attack of the Clones and later action scores by Williams, such as Minority Report and, to some degree, Harry Potter. But there are also a few nods to the action music written for the original Star Wars trilogy. Cues like "Anakin vs Obi-Wan", "Anakin's Dark Deeds" and "General Grevious" offer some wonderful action music, filled with quick tempo changes and a hard working brass section, backed up by busy percussion, with occasional choral outbursts. Some claim that Williams' action music has gotten pretty uninteresting over the years, moving away from the playful, melodic set-pieces that dominated, for example, the original Star Wars trilogy, and instead leaning more on rythm and repeated building blocks. There's no doubt his style has changed, but I actually think that the kind of action music Williams writes today is very entertaining, fresh and memorable. And Revenge of the Sith is packed with it. The action material is what makes the score memorable, but a couple of things unfortunately work to the score's disadvantage. "Palpatine's Teachings", for example, which basically is five minutes of drones. A perfect example to be used by those saying that film music just can't stand on its own two feet, without the visuals. Unless you happen to really dig this kind of underscore, that is. And then there's the entertaining, but extremely lazy, end credits suite, reprising the major themes, as well as a very lengthy inclusion of the Throne Room music from a New Hope. It's clearly a cut and paste job and a rather uninspired one at that. But still, a rather uninspired John Williams is still very good - he is one of the biggest names in the business for a reason - and one can't deny that Revenge of the Sith is a solid and very entertaining score. Also worth mentioning is the included DVD, which features several music videos - i.e. Williams' music in glorious 5.1 sound, set to scenes from all six films - with introductions by an overly serious Ian McDiarmid (Palpatine). Some videos are polluted by dialogue and sound effects, but overall it's a nice thing to listen to, and look at. 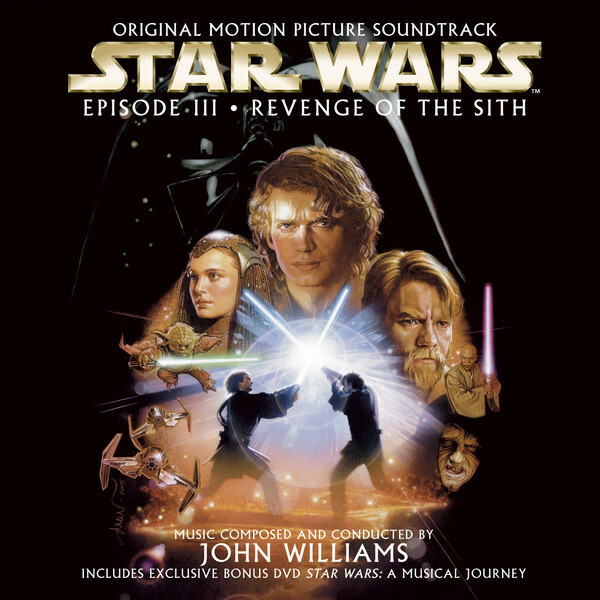 Star Wars: A Musical Journey is a bonus DVD program included with the soundtrack album for John Williams's musical score for Star Wars: Episode III Revenge of the Sith. It was released May 3, 2005. The DVD,contains a collection of music video clips from the Star Wars films, set to selected themes from Williams's scores. It also contains a preview trailer for the Revenge of the Sith video game. Each clip features an introduction by actor Ian McDiarmid. The program can be watched with or without this introduction.